Get ready to hit that reset button, Baby New Year! New Year, New You! Right from the get go, on the evening of the 1st, there’s a Full Moon in Cancer. Resolve an issue concerning women, motherhood, or family issues. The 9th seems like a particularly powerful day, but there is a warning not to get too cocky because pride comes before a fall. Also, around this time, there may be a temptation to take something to the next level to make your point very clear, but getting rowdy really isn’t necessary. Take extra care not to go overboard with food, drink, or anything really. Moderation is key. Remember that Aesop fable about the tortoise and the hare? Have some patience and you WILL get there. There may be a pull to get all emotional, but it would be wise to stick to the facts. If you are too close to something to be rational, you may need some insight from an unbiased source. A new wave of energy is ushered in on the work front during the New Moon on January 17. With Mars going into Sagittarius towards the end of the month, we may find ourselves getting heated and frustrated prematurely. Wait till you know all the details before blowing your top. And then there is ANOTHER Full Moon, this time in Leo which will highlight your creativity and just how much of it you are willing to share with the rest of the world. The 7 of Wands is coming in for most signs. I get the feeling that it is indicative of boundary disputes and people trying to roll up on the scene and change what you have grown accustomed to. Just remember that “no” is a complete sentence. Sometimes though, change can be much needed, albeit uncomfortable. As always, consider your Moon and Rising sign in addition to your Sun. What comes through for each sign is general. 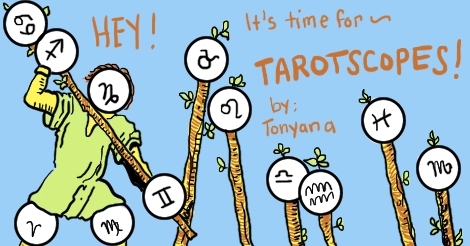 If you wish to have a more personalized reading, please hit my name in the sidebar which should take you to my Etsy shop or message me on my FB page Tarot By Tonyana. Now let’s get to the deetz about January! Week 1: This truly is a new start for you! Just like anything new, you will find yourself getting nervous when you aren’t exactly sure what to expect. There may be some restrictive circumstances to have to deal with while you are just getting your feet wet. Expect that there will be a few snags. Week 2: Adversity seems to be all over the place and when it rains, it pours. You just hope you can recover sooner than later. It may seem unfathomable now, but all the stuff you have been going through as of late, will amount to a beautiful blessing in disguise. Week 3: Tune into your Higher Self this week. Divine Protection is yours, thankfully. Things are starting to bear fruit. You knew all those manifestation practices would amount to something eventually! Don’t get caught up in every little detail. Trust the process. Week 4: Now things are moving! There will be lots of emphasis on paperwork or documents pertaining to money matters. You will find yourself surprised by someone you find very attractive. This person will be in a position of power. Week 1: For quite a while now you have been mostly focused on ambitious aims like career, but now you may find yourself trying to soak up precious family time. Emotional fulfillment and intimate connections are the best things for you right now. Some of you may be exploring a new religion or a new way to connect with God Source. Week 2: You seem to be experiencing a spiritual misfire of sorts, something simply isn’t working anymore. The beliefs you were raised with just don’t work with the individual you are becoming. Work seems like such drudgery this week. If you wish to achieve a certain status, you will have to put in more effort than usual right now. Week 3: Material blessings abound! This is partly because you are showing the Universe that you value yourself by sticking to a exercise regime. When you take care of yourself, the Higher Ups take you seriously and will provide you with what you feel you need to achieve. Week 4: A fundraiser or event doesn’t go as well as you would have hoped. Don’t let it discourage you. There may be some decisions you make about your personal life that others have a hard time understanding. You arrive to the conclusion that a stagnant situation is just veering you further off your Path. It is important to find yourself again. Week 1: Underutilized much? You are getting lost in mundane task when the world really needs you to aim a bit higher. Demand more for yourself! If you can’t do it for yourself, do it for the Greater Good, we need you. Week 2: Work gives you the green light. You will have to show adequate proof to the powers that be that your ideas are bright ones, if you want them to back you down the road. They will protect you and your projects if you are diligent. Week 3: The focus is on protecting what you love, which may require you to travel in order to perceive your situation in a new light. It is advisable not to discuss your finances with anyone that doesn’t need to know. Money is tighter than you care to admit and schedules falling through may be hurting your bottom line. Week 4: Be wary of new people on the scene. It will come in very handy later, if you find a way to document all your interactions with someone you have a bad feeling about. This individual brings some negative energy with them and good people may start falling out of your life as a result. Week 1: It really is best to just fess up to something rather than it coming from anyone else’s mouth and risk getting even more distorted. The awkward feeling that will prevail is only temporary. You may find others distancing themselves from you, but try to be understanding and patient about this. Week 2: I get the sense that there are some Rams out there carrying on relationships that they are trying to be hush-hush about for whatever reason. You just find yourself drawn to someone you click with and you could experience a new start with. They bring light into your days. You find yourself inspired to show up to a certain place, for no other reason than to have a brief interaction. At the very least, whether you act on it or not, you feel it a pleasure to know them. Week 3: Some of you may be planning out an event that will happen around April. You get the sense that you have to find a way to bring certain people together, even if you have to throw a shindig on your own to make that happen. These people love you, though they may not be physically present in your life in the way you would like. Week 4: You are spending an awful lot of time wrapped up in your thoughts. What to do about love matters is high on that list. You just wonder what it would have been like if you had made another decision and weren’t so knee-deep into a huge choice. Week 1: What a difference a year makes! You will be over the moon about news pertaining to your family and will say, “It’s been a long time coming!” This may change your priorities a tad. Week 2: It is pertinent to connect with your soul purpose and start accepting the fact that this may require you to embrace a leadership role. You need to be 100% committed to achieving a goal. A door is opened to you and offers an opportunity to pursue life in a more purposeful way. Plans are great, but don’t get caught up in details. It is important to be open to opportunities that you hadn’t seen coming as well. Week 3: You find yourself in a new situation where you have to guard yourself from people infringing on your space. Make a pact with yourself to not feel guilty about keeping certain types at bay. Parasite types will hold you back from being your personal best. You oughta know this by now. Friendships are important, but it is about quality, not quantity. Aim a little higher. Week 4: That old feeling of lack creeps up again. Accept that those voices that trip up your confidence exist in everyone. Acknowledge it, don’t fight it. Instead, thank the nagging feeling for reminding you how far you have come and then dismiss it. Eventually the sinking feelings will be uplifting when you realize your power to transform your inner world, which will affect your outer one as well. You are gaining serious ground now! Week 1: Some of you out there may be having your hands a bit too full on the romance front. The time is way past to fess up, you really must come to a decision before you do some irreparable damage. You better be quick on your toes! If you treat others as you would like to be treated, this can still go well in the long run. Week 2: Someone is kissing and telling. I feel like this attraction has been building up for a while now. You really like this one! Make sure that the people you are letting in on intimate details are truly happy for you and not just accumulating jealousy. Week 3: You may be experiencing some pangs of regret. What’s done is done. Someone is giving you grief for not handling a situation in the way they would’ve expected you to. Things may never be the same between you. It looks better on paper than in real life. You may feel like you failed, but it is important to look around and see what you can build from. Get some meditation in. Week 4: A friend will offer you their shoulder to lean on, a hand to squeeze, and their ears to bend. They will sustain you and keep your momentum up. Ask them to help you stay committed to a personal goal. There may be an anniversary party, wedding, or some celebration to attend. Week 1: It would be wise for you to revisit an old meditation or spiritual practice; you will make strides now. There ought to be some type of mantra or positive affirmation involved to keep you focused, at first. Envision yourself being happy and living the kind of life you have always dreamed of. Make sure that you show gratitude for every little thing! Week 2: You find certain types trying to parasite off of the results of your efforts. Here you had to do all the hard legwork and they roll up invading your turf. When you find yourself frustrated, remember that these people simply aren’t you. That essence you have cannot be copied and pasted. Just let it go. Week 3: If you find yourself bending over backwards to please another this week, it may be high time to reevaluate why you are continuing this connection. Friends are people who encourage you to grow and accept when you want to make changes in yourself. Have a real discussion with people you work with about how you envision this year going and their expectations as well. Week 4: You may attract the perfect person to assist you on a passion project, of sorts. Things are about to get plenty interesting! This person will provide you with so much enthusiasm that you will feel unstoppable. Week 1: You decide to give yourself a bit of a break before you get rolling again. There are some loose ends to tie up first. It is especially tough to get out of your head this week and just relax. Allow yourself to slow down a bit. It is best to start this year off right and a sound foundation, so take the time you need. Week 2: Surround yourself with people who push you even further to be the best you can be. It is okay to have a competitive nature as long as you don’t get bogged down by comparing your accomplishments and wins to another’s. You will stand out in your own way, so wish your contenders well. It is quite possible to not forget, yet forgive. What was an obstacle last year can be a distant memory. Allow that! Week 3: You may regret telling a little white lie to spare another’s feelings. The only reason you did such a thing was to inspire someone to believe in themselves. In the process, you may have created a Frankenstein Me-Monster! Let this be a testament to just how great of a motivational speaker you are! Also, maybe be more discriminating about who your audience is in the future. Week 4: Be stricter about boundaries concerning your time. You are trying to accomplish something here and you can’t be interrupted so much! It may behoove you to guard your secret recipe to success. The two of you may be like two peas in a pod today, but things change and they need to find their own style anyways. Week 1: Everyone seems to expect you to make time for their every concern. They also feel like when you accomplish things, they are entitled to a piece of the pie. The time has come for you to pamper yourself and have no sense of remorse about it whatsoever. In order for you to keep receiving good things, you must show the Universe that you appreciate it and that it isn’t a hassle to receive. Week 2: Some Virgo women may be having some hellish hot flashes and/or hormonal changes. The unpredictability of what you are experiencing may lead you to decide not to go to an event after all. You decide to just send a gift or flowers instead. Week 3: You want to get away on a vacation or something, but in this instance, I feel like the problem will follow you wherever you go. To think the grass is any greener some place else is folly. This restless feeling won’t last forever, so just ride the tide. Week 4: You may prefer the scenic route this week and will tell everyone not to make a big fuss and “take your time.” This is truly rare form for you! It’s just that you noticed that if you let go of controlling things every once in a while, life just sorta takes care of itself and will surprise you in wonderful ways. All in good time, my friend! Week 1: It is high time that you made opportunities for yourself rather than waiting for things to drop into your lap. Sure, great things certainly ARE coming your way, but it will still require effort on your part. Find a way to promote yourself yet stay humble. This year will be much better than last! Week 2: Relationship challenges can definitely be worked out this week. It may benefit you to keep a dream journal. Working with your subconscious in order to improve circumstances in waking life can really work wonders if you are disciplined enough. Romance will be restored before you know it! Week 3: Refrain from having a cutthroat approach to achieving your goals. That really isn’t your style and you need not fight fire with fire — you are above all that. It is quite possible that recent events are transpiring to push you out of your comfort zone to do something new. Week 4: Instead of being dismayed by a situation that isn’t working out, align yourself to what IS working and go with that! This can be a new beginning for you and a great way to discover more about yourself. A friend may help to make a transition, but don’t get too used to them sticking around either. Life is about change, embrace it! This is exciting stuff! Week 1: You say adios to drama and chaos. It has been a long journey, but you are finally coming to grips that everyone is a little nuts and maybe “normal” is as other-worldly as a unicorn. In the past, you have kept quiet about your spiritual beliefs, but now you use it as a quick way to weed out people who will never really accept you anyway. Week 2: It would be a great week to take a bit of a breather and review where the choices of last year got you and how to make 2018 be even better. In any spare time, it may be wise to exercise and research healthy recipes. Gear up for what is ahead. Week 3: You may have to admit when it becomes apparent that certain people in your life really don’t want you to better yourself. Resolve to do something about this once and for all. It is quite possible that you will never be able to grow in their presence. If you aren’t growing, you are wilting. Week 4: Others may have snarky things to say about your leadership skills. You aren’t there to make friends, you are there to get paid. Again, this is about people getting too comfortable in their little boxes and are resistant to change. This isn’t your problem. Your new ideas will shake things up in a wonderful way and if they can’t handle it, they won’t be around for very much longer anyways. That’s what you do: transform things. Week 1: Someone may challenge you and make you lose your stride if you aren’t careful. You really don’t go around looking for trouble and the fact that it always seems to find you kind of takes the wind from your sails. Don’t let it get you down! It’s a waste of energy to worry about it and if you brood too long, it may affect your health. You can’t teach others how to be a good person, they gotta want to first. Week 2: An important event occurs and it sets the tone for the rest of January. It helps you regain a sense of purpose and helps you release the past. For too long you have lacked in the love department and this will stir up something inside you that you thought was long gone. There may be a meeting with someone whom you feel strongly attracted to. You just feel so drawn to this person because they have such a light about them, it’s irresistible. Week 3: There may be jokes at your expense, but you handle it with such class that you appear sheepishly charming instead of a victim. You could teach a class on social self-defense! Make sure you are extra clear about communications this week. Week 4: Be careful not to commit to anything just yet. Don’t sign any contracts, agree to anything, or lead anyone on. You don’t want to feel owned and it may be hard to get out of situations later on. It’s like you fly right into someone’s web and they keep you around till it’s time to feed. This is no time to be polite, no means no after all!